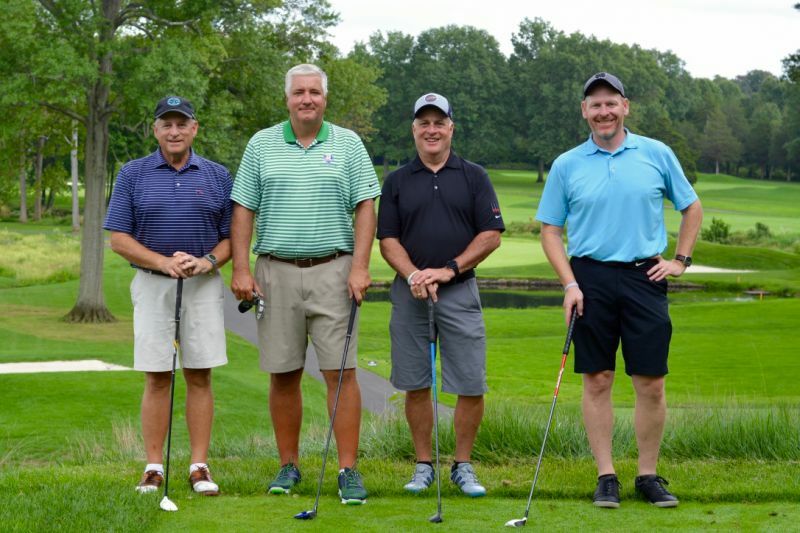 The rain held off on September 17th as 48 foursomes took over two courses at Expect Miracles Foundation’s Inaugural Atlantic Coast Classic at Fiddler’s Elbow Country Club, in Bedminster, NJ for a wonderful day of golfing, networking, and fighting cancer. The event’s success was greatly attributed to Foundation Sponsors, BNY Mellon, Eagle Investment Systems, and ICE Data Services along with the other 70 companies that sponsored or participated in the tournament. Guests enjoyed 18 holes of golf featuring exciting contests and on-course offerings including a great selection of craft drinks generously provided by Hunterdon Brewing Company. After a great day of friendly competition on the links, the participants enjoyed a lovely reception back at the clubhouse. The evening was Emceed by Duncan Schieb, who kicked off the evening with an exciting live auction of a trip to Aruba, Patriots vs. Jet’s tickets, and more! Frank Heavey, Executive Director of Expect Miracles Foundation, was welcomed to the stage to explain the mission and purpose of Expect Miracles Foundation and express how gracious The Foundation is for all of the support from sponsors, participants, and volunteers. Heavey then welcomed Ramya Sridharan from the Heller Research Lab at Memorial Sloan Kettering Cancer Center to the stage to accept a check for $250,000 from Expect Miracles Foundation. After the check presentation, Duncan Schieb challenged the guests to see if they could raise an additional $10,000 through a text to pledge platform to support The Heller Research Lab at Memorial Sloan Kettering Cancer Center. Schieb also shared that Hennessy Funds would generously match all donations up to $10,000 raised. In just 5 minutes the crowd raised over $11,000! Thank you to everyone who made a donation and a very special thanks to Hennessy Funds. Founder and Chairman, Frank Strauss, then took the stage to express his appreciation for all who made this and every Expect Miracles Foundation event such a success, while sharing the amazing evolution of Expect Miracles Foundation over the past 24 years. What started as a friends and family golf tournament has transformed into a non-profit that rallies the financial services industry to invest in life-saving cancer research and advance patient care programs nationwide. Next, Assistant Director Maggie Dombroski announced two upcoming Expect Miracles’ events: the 15th Annual Wine & Spirits Event on November 7 in Boston and the 5th Annual Expect Miracles in Manhattan Event on January 24, 2019 in New York City. She then presented a special Recognition Award to Wayne Weaver of BNY Mellon for his tireless efforts in raising over $27,000 for the Expect Miracles Foundation by running the 2018 Boston Marathon in historically horrible running conditions. This great event would not have been such a success if not for the generous support of amazing volunteers who worked a long day, the incredible event partners, all our guests, sponsors and donors. Thanks for another great tournament in support of our mission! We look forward to seeing you at the next event!